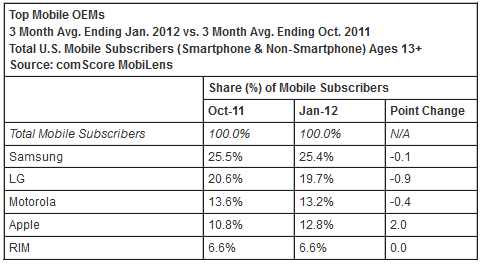 Market research firm comScore on Tuesday released the results of a three-month study on the U.S. mobile phone industry. Android and iOS continued to grow between November and January, gaining 2.3% and 1.4% respectively. Google’s mobile platform topped the charts with a total market share of 48.6%, while Apple managed to capture a 29.5% share. Research in Motion and Microsoft, however, continued to tumble, falling 2% and 1% in the same period. After surveying more than 30,000 U.S. mobile subscribers, comScore found Samsung to be the top handset manufacturer with a 25.4% market share. The company was followed by LG with a 19.7% share, Motorola with 13.2%, Apple with 12.8% and RIM with a 6.6% share. The research firm also found that the number of U.S. smartphone subscribers increased 13% since October and surpassed 100 million users for a total of 101.3 million. ComScore’s press release follows below. RESTON, VA, March 6, 2012 – comScore, Inc. (NASDAQ: SCOR), a leader in measuring the digital world, today released data from the comScore MobiLens service, reporting key trends in the U.S. mobile phone industry during the three month average period ending January 2012. The study surveyed more than 30,000 U.S. mobile subscribers and found Samsung to be the top handset manufacturer overall with 25.4 percent market share. Google Android continued to grow its share in the smartphone market, accounting for 48.6 percent of smartphone subscribers. For the three-month average period ending in January, 234 million Americans age 13 and older used mobile devices. Device manufacturer Samsung ranked as the top OEM with 25.4 percent of U.S. mobile subscribers, followed by LG with 19.7 percent share and Motorola with 13.2 percent share. Apple continued to capture share in the OEM market with 12.8 percent of total mobile subscribers (up 2.0 percentage points), while RIM rounded out the top five with 6.6 percent. The number of U.S. smartphone subscribers surpassed the 100-million mark in January, up 13 percent since October to 101.3 million subscribers. Google Android ranked as the top smartphone platform with 48.6 percent market share (up 2.3 percentage points) followed by Apple with 29.5 percent market share (up 1.4 percentage points). 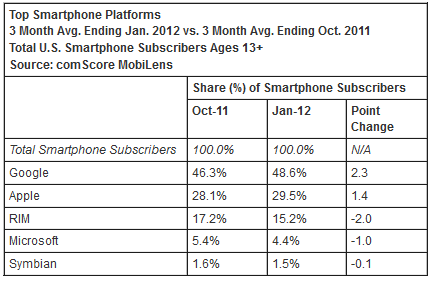 RIM ranked third with 15.2 percent share, followed by Microsoft (4.4 percent) and Symbian (1.5 percent). In January, 74.6 percent of U.S. mobile subscribers used text messaging on their mobile device, up 2.8 percentage points. Downloaded applications were used by 48.6 percent of subscribers (up 4.8 percentage points), while browsers were used by 48.5 percent (up 4.5 percentage points). Accessing of social networking sites or blogs increased 3.4 percentage points to 35.7 percent of mobile subscribers. Game-playing was done by 31.8 percent of the mobile audience (up 2.6 percentage points), while 24.5 percent listened to music on their phones (up 3.3 percentage points).